The real source of Barnes’ 2018 struggles was his inability to hit fastballs and right-handed pitching. Through the end of 2017, Barnes’ performance against righties was good for a slash line of .282/.395/.389 with a 118 wRC+ (178 plate appearances). A dismal 2018 saw him slash just .252/.298./.186 with a 31.7% strikeout rate against right-handers. Barnes’ Whiff% nearly doubled – from 8.4% in 2017 to 14.8% in 2018. His Pitch Value performance against fastballs dropped from 5.7 in 2017 all the way to -7.1. Meanwhile, Barnes contact rates against breaking and offspeed pitches remained relatively consistent. His O-Swing% increase of 2.5% suggests he wasn’t swinging at many more bad pitches, either. 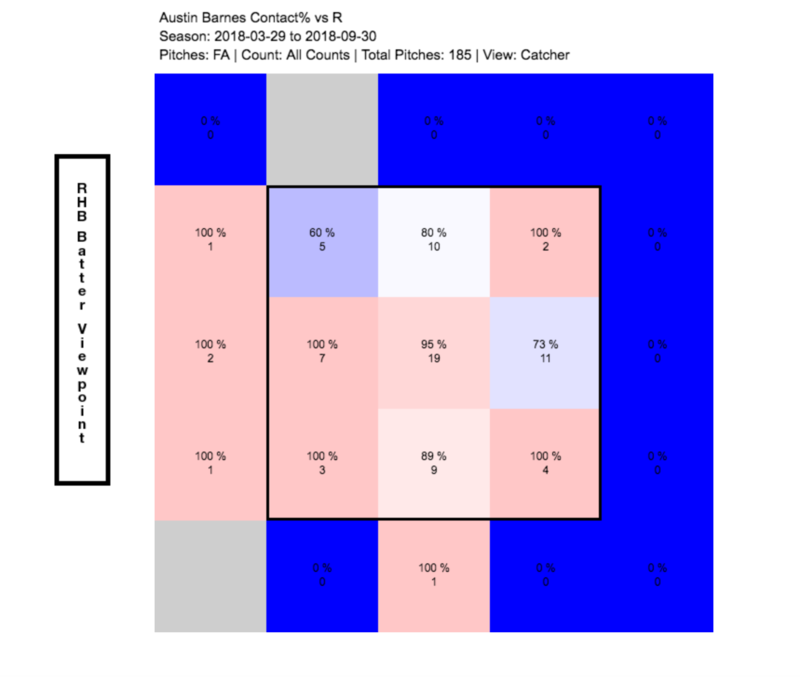 In a limited sample, it looks as though the 29-year-old catcher struggled with fastballs in the upper part of the zone. There are reasons to think that that Barnes can rebound. At this point in time, his issues against right-handed pitching and fastballs appear to be contained to his 2018 season. Throughout his 2018 struggles, Barnes continued to walk at a good clip (13.0 BB%) and there is potential for his inflated strikeout rate to drop (.299 career average in six minor league seasons). His pitch framing and receiving skills should help him earn playing time, although it’s worth noting that Russ Martin is also considered to be a strong receiver and framer. Barnes is currently being selected as the 27th catcher off the board in NFBC drafts. That’s a hundred picks after Isiah Kiner-Falefa (16), Jorge Alfaro (13) and Mike Zunino (12); over fifty picks after Austin Hedges (20) and Jonathan Lucroy (21). If he is able to return to form, he could out earn all of them. If you split the difference between his 2017 and 2018 seasons, his on-base and stolen base contributions mean he could be rosterable in many formats, even with modest power production. Unlike his platoon-mate, Russell Martin, there is also some potential he can hit for average (one of the most difficult things to find late in drafts). Barnes’ role is not 100 percent guaranteed. He will still have to contend with Russell Martin for playing time; and both Will Smith and Keibert Ruiz are highly touted catching prospects in the Dodgers’ farm system. But given his draft position and that he’s succeeded about as much as he’s failed in the major leagues, Barnes could be a good value at fantasy’s weakest position this season. His breakout isn’t guaranteed but it shouldn’t be written off just yet, either. 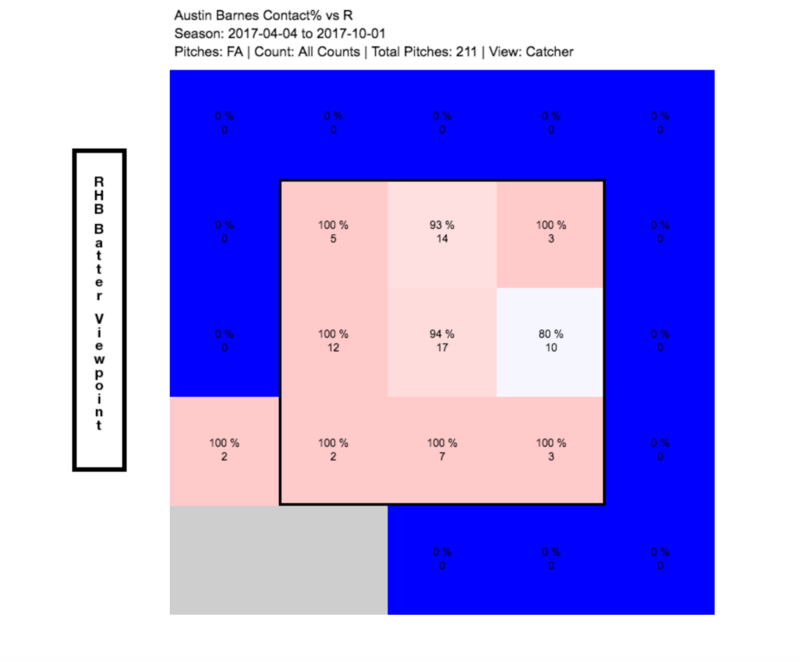 We hoped you liked reading Can Austin Barnes Still Breakout? by Nick Dika! Nick thinks running a Major League or fantasy baseball team is incredibly easy. Until he is handed one of those coveted GM positions, his writing at RotoGraphs will illustrate how to do it properly. Fantasy baseball trade consultations and anything else can be sent to nick.dika@gmail.com or tweeted to @nickdika. I had forgotten Barnes was 29 (i.e., thought he was younger), and it’s concerning that his troubles seem to be going against the current of recent trends (i.e., more high heat is likely on the way). Funny though: His battery-mate Russell Martin has a long career of raking against fastballs. Versus 4-seamers, Martin has a career OPS of .912, career wOBA of .397, and WRC+ of 161 (all of which he exceeded in 2018 at age 35). I also seem to recall him liking high fastballs in particular but a couple minutes of tinkering with the heat map doesn’t seem to really bear that out in an obvious manner (I will still enjoy my anecdotal memory of him pulling a neck-high heater into the seats followed by the announcers saying he loves that pitch). It will be interesting to see how the playing time is divided this year. P.S. Sorry to be pedantic, but “breakout” is a noun (or adjective). Used as a verb, it should be “break out”. Thanks for reading! And always feel free to let me know if I’ve used something incorrectly. I’m curious to see how Martin looks in 2019.